Life since early March has been a bit of a blur. A large part of this was due to the fact that I came down with a bad cold that turned into a lingering case of bronchitis. I’m new to this kind of respiratory distress and so I waited way too long to go to the doctor. Eventually I did and my doctor diagnosed me with a mild case of bronchitis and sent me on my way with a handful of new prescriptions. Albuterol, a steroidal inhaler and even vicodin for the cough. On top of my normal regimen of allergy medications, I feel like a walking pharmacy. But the drugs appear to be working, albeit slowly. I’m feeling more energetic, am able to breath clearly and an coughing. In the middle of all this bronchitis stuff, I moved in with my partner Sherri. I do not recommend moving while sick if it can be helped. I hired movers, but even then it took me forever to pack my tiny studio and even longer than forever to get it unpacked (we’re still opening boxes and sorting through stuff). But I love living in a house again (for the first time, really, since leaving my parents home when I was 17). Having all the extra space available is wonderful. Having a yard is a privilege I adore. Though, I’m realizing how expensive home ownership and maintenance can be. We spent several hundred at Home Depot this month just to get the yard and garden in shape. And we’ve still so much to do. But the garden is simply lovely. The state of the yard when I moved in was fairly over grown. The blackberries emanating from the corner of the yard were threatening to take over. The raised beds built last year were either unfinished or completely full of weeds. The first sunny weekend available to us, Sherri and I attacked the yard with furry. I demolished the insidious blackberries. We yanked weeds out of the beds. We bought dirt, lots of dirt. So much dirt in fact that Sherri did not think it would fit in my little Toyota pick up (it totally fit, barely). We filled the beds and mixed in compost. Because it’s already so late in the season, we opted to buy starts, most of which came from the Portland Nursery. In fact, we went a little crazy with the number of starts we bought and had to get creative about where to put them. We have a half dozen varieties of tomatoes (including one called pineapple that I’m very excited about), peppers, summer squash, some heirloom eggplants, bush and pole beans, winter squash, a melon and an heirloom cantaloupe, and various greens. I take great delight in watering everything each morning, looking for signs of new growth. I August and September we’re going to have more fruits and veggies than we know what to do with! We also planted a handful of annuals and perennials in the front yard. During Memorial Weekend, Sherri and I were supposed to attend a couples retreat together at Great Vow Zen Monastery. But, Atari is in the middle of treatment for a urinary tract infection and may also have diabetes. I didn’t feel comfortable leaving town while his diagnosis was still up in the air. So, we elected to stay home. Knowing that we were now going to be in town, a good friend from college decided to visit. We ended up taking two mini road trips, one to Hood River and the other to the Coast, with a detour to pick strawberries. Sherri good some good photos and also wrote about it here and again here. Somehow during all of this I managed also to give a talk on CodeIgniter at the April meeting of Code ‘n’ Splode and I volunteered at this year’s BarCamp. I also finished a volunteer project that I’d been working on — the website for a friend’s NGO, the International Cardiovascular Health Alliance. Things aren’t going to get any quieter anytime soon. 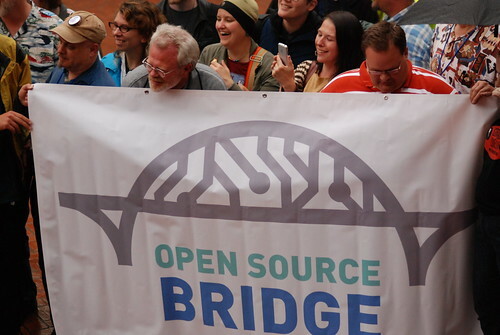 Next month I’m volunteering for and speaking at OSBridge, a conference for open source citizens. My Zen community is also holding a founder’s dinner for our Portland Center. Sherri and I will be attending and helping out with that. Because I haven’t seen my family since Christmas, Sherri and I are going to Sacramento the weekend after my birthday. I’m not looking forward to the sweltering Sacramento heat, but it will be nice to see everyone and get to show Sherri my old ‘hoods. We’ll probably take a side trip to Davis so I can show her the campus and town. I’m sure it will be a shock to me how much Davis has grown since I left (it always is). And all of that is happening in June!